I've been drowning myself these days by drinking tons of water to help keep my skin hydrated, but it just isn't enough. I grimace whenever I look into the mirror and see cracked, flaky skin looking back at me. And my eyebrow threading lady rolls her eyes as I lie back in her chair before saying for the millionth time, "Your skin is so dry." Obviously, I needed to step up my moisturizing efforts. So when the Sephora Instant Moisturizer landed on my desk, I twisted the top off and got to slathering it on. 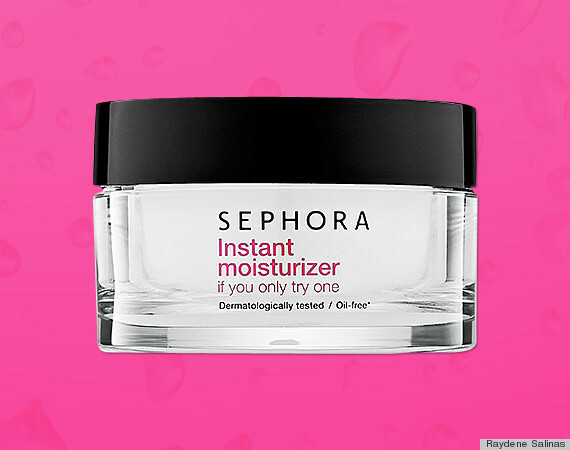 Sephora Instant Moisturizer $22. Available at Sephora stores. At first glance, the moisturizer looked thick and heavy in the glass jar. However, I was shocked at its lightweight texture. Because my skin skews on the sensitive side, the cream's paraben-and-oil-free formula blended with moisturizing ingredients like white tea extract and vitamin E also made it appealing. It only took a quarter-size amount of the Sephora Instant Moisturizer to cover my entire face. I could immediately feel and see how it locked in much-needed moisture. The finish was quite smooth and my complexion did appear brighter over my two weeks of use. However, I did use tinted BB cream or liquid foundation to bring a bit of color back into my face. Rating: 4 out of 5. Dry skin be damned with this moisturizer.